Quinnipiac’s future is now in our hands–in the form of the first draft of President Judy Olian’s strategic plan, which is now public and ready to be critiqued by the Quinnipiac community. Groups around the university have been eagerly anticipating the release of plan in hopes that it will include provisions for their respective institutions. The first draft did not delve into specifics but the highlights included a new health and wellness facility, efforts to increase diversity of students and faculty and a rich alumni connections program. The draft, which was outlined at the Faculty Senate meeting by Executive Vice President and Provost Mark Thompson on Jan. 28, will be refined based on feedback from staff, students and faculty. The complete draft is available to students on Blackboard and can be accessed via a link in a Jan. 29 email from President Olian. The schedule for the town hall meetings can be found in Olian’s Jan. 29 email as well as a link to an online forum to submit feedback. 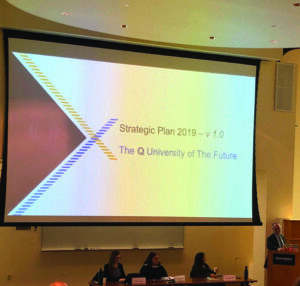 The plan will include four main goals to help Quinnipiac become the “University of the Future.” These goals were based on advice and input from a diverse group of “task groups” representing all aspects of the Quinnipiac community. The first goal is to “build and employ an institution-wide mindset that prepares graduates for citizenship and 21st century careers.” Thompson acknowledged “pockets” of career preparation across campus, but said that these areas of growth lacked support from the institution as a whole. 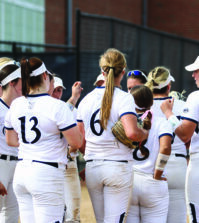 The second is to create an inclusive, excellence-driven community. The focus of this goal is to attract diverse students via a new summer bridge program and academic advisers that specialize in the retention of at-risk groups. The third goal is to nurture and impact internal, local and global communities. The focal point of this goal includes the construction of a state-of-the-art health and wellness center for physical health as well as counseling services. The health center is part of a “Facilities Master Plan” which also includes residential housing updates. The acknowledged lack of space on Quinnipiac’s campuses for expansion and larger facilities drew a laugh from the senate. Faculty Senate member and Chair of the Department of Journalism Margarita Diaz cited the new facilities plan as one of her top priorities. “I know that we all want to see a clear facilities plan that provides additional space for classrooms and faculty offices, as well as a commitment to allocating the necessary resources to deliver on Quinnipiac’s promise,” Diaz stated in an email. Faculty Senate Chair Charlotte Hammond described the lack of classroom spaces as “the elephant that continues to be in the room.” She suggested that donors eager to fund Quinnipiac’s future in a tangible way should contribute money to increasing classroom spaces. 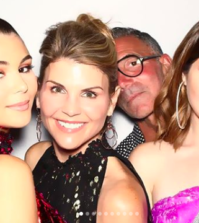 The final goal is to foster lifelong success and communities, which means extending and improving connections with alumni. This will also involve creating a networking program that engages the university with network partners. The success of the plan will be measured through student retention, employment, diversity and philanthropy. Ultimately, the plan hopes to solidify a “Q Promise for the Future.” As a “University for the Future,” Quinnipiac will become more adequately prepared to prepare graduates for a life after college by partnering with employers and individuals to help graduates transition into a successful professional career. Funding the future of Quinnipiac will come at a price, but this is something Olian has considered when crafting her plan. 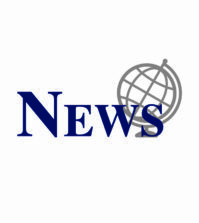 “We’re taking a holistic look at the budget for the first time in a long time in terms of what makes sense for us to continue investing in and whether or not it connects to our vision of the future,” Thompson said. Quinnipiac’s radio station, AM-1220 WQUN did not connect to this vision, and thus is scheduled to close in June 2019. The radio station was closed due to decline in student interest in the industry, according to Vice President of Public Affairs, Lynn Bushnell. After viewing the first draft of the plan, Diaz believes the plan has promise. “I am encouraged by the prominence of diversity in this early draft and look forward to working with the administration to produce a blueprint that we can all get behind,” Diaz stated. Olian will be presenting the plan to the student body on Monday, Feb. 4 at 5 p.m. in Buckman Theater, but Jeremy Gustafson, a freshman political science major, already has some ideas.